Esta subida la publicitan en todas las agencias de viajes de San Pedro, San Marcos o San Juan. Siendo estos últimos los lugares más cercanos desde donde podremos acceder de manera directa. El coste es de 100Q por persona, con el transporte, guía y ticket de entrada incluidos. Desde otros pueblos del lago, como Santiago o Panajachel es necesario tomar una barca a San Pedro. El principal atractivo es poder llegar para ver amanecer desde la nariz, para ello tendremos que empezar bien pronto, sobre las cuatro de la mañana. Si hay suficiente gente que haga la excursión, la agencia nos llevará en shuttle. Si no deberemos tomar un chicken bus que en una hora nos dejará en Santa Clara, lugar de partida de la ascensión. La manera de hacerlo por tu cuenta es tomando el chicken bus o un tuk tuk a Santa Clara y decirles que nos paren donde comienza la senda. La segunda opción es la más costosa, unos 40Q por trayecto. Tras una hora en bus nos bajamos en Santa Clara, donde comienza la ascensión. Son las cinco de la mañana y no se ve nada, encendemos nuestras linternas para seguir a nuestro guía que va sorteando caminos en la oscuridad. Al principio el sendero no tiene apenas pendiente, pero a cinco minutos de haber empezado comienza un camino con escaleras pronunciadas entre lo que suponemos son campos de maíz. Entre lo empinado del terreno y que nuestras piernas todavía no se habían recuperado de la subida al San Pedro, nos tuvimos que parar cuando tan solo llevábamos un cuarto de hora de ascensión. Mientras descansábamos teníamos en frente un mar de nubes que se suponían tapaban todo el lago. Nuestro guía nos aconsejó que hiciéramos un último esfuerzo. Venga, animó que tenemos que ver “El color”. Qué razón tenía. Llegamos al primer mirador lleno de un manto blanco que poco a poco se fueron tiñendo del color naranja. El esfuerzo había merecido la pena, estábamos ante uno de los amaneceres más bonitos que hemos visto nunca. Con el Sol mostrándose sobre las nubes seguimos caminando por la nariz en dirección al mirador principal. Este es el punto donde se debe pagar la entrada. Las vistas son de las que quitan el hipo. 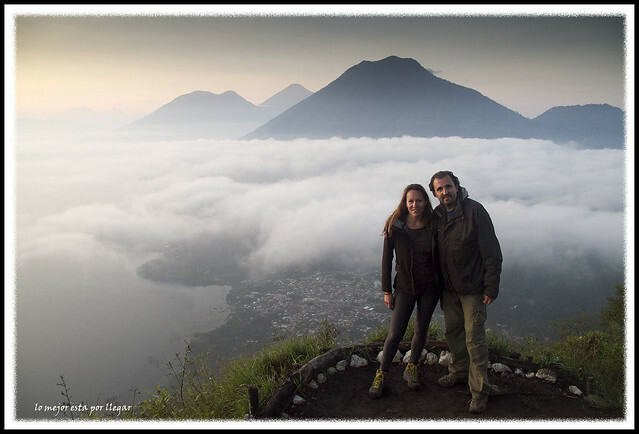 A nuestra derecha se pueden ver los tres volcanes del lago Atitlan y al fondo otros cuatro más. Incluso se puede adivinar alguna fumarola de uno de los volcanes activos que tiene Guatemala. Mientras vamos esperando que se despeje el día nos preparan un cafelito reconfortante que nos sienta de miedo. Mientras va llegando gente intentamos empaparnos de esta maravilla. ¿Qué posibilidades tenemos de estar frente a siete volcanes viendo amanecer? Esto solo pasa en Guatemala 8). Nosotros aconsejamos hacerlo con guía. No es fácil encontrar la senda principal en Santa Clara y además el camino tiene bifurcaciones que pueden confundirnos en la oscuridad. Es aconsejable llevarse calzado de montaña, sobre todo si el terreno esta embarrado, y algo de abrigo pues por la mañana hace frio incluso en verano. Puede darse el caso que subamos arriba para ver tan solo amanecer. Hay días muy nublados en los que no se ven los volcanes. Aun así, merece la pena. Esta entrada fue publicada en Guatemala y etiquetada Amanecer, América, Centroamérica, Guatemala, Guatemala Belice y Honduras, Lago Atitlan, Nariz del Indio, San Juan, San Marcos, San Pedro de Atitlan, Volcan por lomejorestaporllegar. Guarda enlace permanente. Caramba! Estuvimos hace bien poco en Guatemala e incluso le dedicamos algún post a Atitlan, sin embargo, desconocía la existencia de la Nariz del Indio. Pues ya tienes excusa para volver jejeje. No se cuantos días estuviste en el Lago, nosotros le dedicamos 4 días completos y nos dio tiempo a hacer muchas cosas. Es una ruta sencilla para hacer con niños. 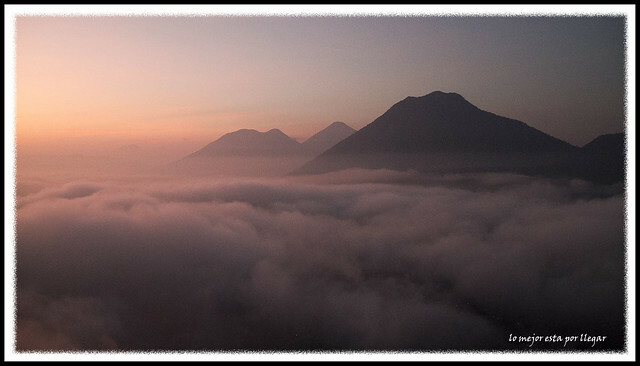 Un saludo y gracias por pasarte y por el comentario..
On February 13, 2018, a friend and I hiked to the popular La Nariz on Atitlan for the sunrise. What started as a promising sunrise excursion turned into a harrowing experience that highlights how I believe tourists are openly targeted for violent crime by the locals with the tacit permission of the local authorities. On our journey up the mountain, guides and other tourists accompanied us. After the sunrise, my friend and I followed behind the group. However, as my friend tried to descend from the peak, a young guatemalan man in front of my friend turned, pulled out a machete, put it to my friend’s throat and demanded his money. My friend quickly backed away and ran down the hill through the brush. As my friend ran, the man picked up and threw grapefruit sized rocks trying to kill him. Already being further down the mountain, the guides and the other tourists fled. Unfortunately, everyone else’s escape left the young man shoving me at machete point demanding my money. After a tense few minutes of talking, I gave him my money (120Q) and ran down behind my friend. As we descended, another man with a machete blocked our path and demanded even more money. We ran through the brush and escaped. When we arrived at the town below, we stopped at a small tienda and told the lady what had happened. While talking with her, the two bandits walked past. We told the lady they were the criminals who had assaulted us. She knew who they were and gave us their names. She also called the police for us and told us that she was afraid to get involved. Twenty minutes later, when the Guatemala national police arrived, we told them what happened and gave them the criminals’ names and a picture. The police asked us if we wanted to file a report. We told them that this was their community. If it helped the community, we would. Otherwise, we would just leave. They said they wanted us to file a report so we followed them to the police station. As it turned out, we didn’t need the criminals’ pictures or names. They met us and the police as we walked through town. As expected, they denied holding us at knifepoint, kidnapping me, or trying to kill my friend. When we arrived at the police station, neither the town police nor the national police took a report. We reviewed nothing. We signed nothing. Neither man was arrested. We left enlightened. It’s highly unlikely that the local authorities don’t know this. In the end, going to La Nariz is simply dangerous. It is remote and away from town giving criminals the time and space they need for their dirty work. With proper support from the police, it could be safe. But in my experience you, as a tourist, are considered by the police and the guides to be fair game to the locals who are regularly committing violent crime against foreigners. If you are the adventuresome type and don’t mind being robbed at knifepoint for a few bucks, then the sunrise at La Nariz is nice enough. You’ll get some exercise and see a pretty sunrise. If you are squeamish about being subjected to violent crime, you may want to consider other sightseeing options. After talking with lot of people, it also seems that virtually all paths around the lake are being worked similarly by violent criminals. The guides will tell you that it’s safe if you go with them, but it’s not.